Funky First Grade Fun: May Currently! How could it be that this seems like the longest year and the shortest year of my life all at the same time? Listening - I'm listening to the rain hit our windows and wondering how I'm going to get 5 dance costumes in and out of the auditorium today without getting them wet. Loving - Just a few minutes of peace and quiet. I needed this more than I can explain. Thinking - I love to watch my daughter dance. It seems like yesterday that she went on stage with her first little teal tutu. Today, she will dance her way on and off the stage 5 different times in each recital. I am so very proud of her...my heart feels like it's gonna burst when she dances onto the stage. Wanting - I need to clean out my cabinets at school. You could say I had a bad week last week. My students are amazing and they worked so hard, while I was working hard to try not to let them notice that I was disappointed in a big way by adults. Cleaning always makes me feel better...so next week the cabinets will be cleaned out. If I haven't used it this year...goodbye. Needing - I do believe that God has a plan for each of us. When you're feeling discouraged about something, it is so hard to have faith in his plan. But, I need to. Especially if I'm gonna keep walkin' around preachin' that to my own kids. Surprise - My friend, Jennifer was one of the first bloggers I connected with when I first started blogging several years ago. 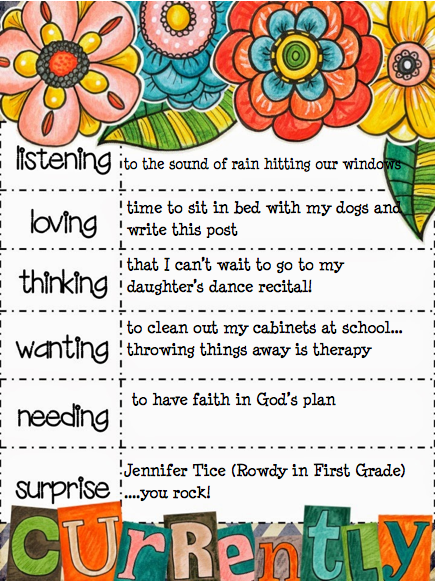 Jennifer's blog, Rowdy in First Grade, is one of the blogs that I always read, even if I'm too busy to read my whole list. We live across the country from each other and I feel like we've met...but we haven't. Several times over the years I've wished we could be teammates. I just can't figure out how to make that happen. Jennifer is so sweet and she always makes me laugh! She is a beautiful person inside and out. I have about 50 pictures on my phone of things on my "to post about" list. In between dance, travel baseball, travel soccer, piano and the obvious school commitments that come with two little kids with two teachers for parents...there has not been much time to work on my list. I'll have more time to work on my list soon. And can I just say...I'm so proud of Farley! If you follow her on a regular basis you'll know that she is working so hard, gettin' fit and lookin' good! Go girl! Head over to visit her to check out what is going on Currently with everyone. I totally understand the want to clean out cabinets at school. (Or, I would if my classroom had cabinets... I just need to clean all the bookshelves and tubs and... *shudders*) Good luck! Hey Kimberly, I'm headed to school to pack up my room and clean out my cabinets. All of 2nd grade is moving out to trailers next school year. It sounds like maybe something is going on for you. I hope it gets better. It's been a trying year for me to say the least. I definitely believe that everything happens for a reason though. Enjoy your daughter's recital though. Those are always so much fun and very cute! Have fun at your daughters dance recital! cleaning out cabinets. OMG. something I dread. I like to "clean," and by clean, I mean shoving things in cabinets so they're out of sight. Cleaning out my cabinets is def something I need to do too! I love to clean out cabinets, too!!!! I hope no adult is being mean to you, btw!! And I'd love to see a snippet of your daughter dancing -- please!!? ?